The venerable, highly acclaimed Jack Nicklaus layout at Shoal Creek outside of Birmingham, Ala., is staged to host 81 of the most talented seniors in golf this week at the Regions Tradition, a major championship on the Champions Tour and the first of the 2014 season. This week’s tournament, which tees off Thursday, is the first of three majors to be held on a Nicklaus-designed course this year, and is one of a company-record 25 Tour-sanctioned events scheduled for Nicklaus Design courses in 2014. The other majors hosted on Nicklaus courses are the Senior PGA Championship (Golf Club at Harbor Shores) and the PGA Championship (Valhalla). The 81-man field—between them they have amassed 470 PGA TOUR wins—will compete for $2.2 million in prize money over the four-day event, which is televised live on the Golf Channel. Air times are Thursday and Friday from 12:30 p.m. to 2:30 p.m. ET, and from 3:00 p.m. to 5:00 p.m. ET on Saturday and Sunday. The defending champion is David Frost, who edged Fred Couples by one shot in 2013 for his first senior major championship title. In addition to hosting the Regions Tradition since 2011, the 7,231-yard Shoal Creek course has hosted two PGA Championships (1984, 1990), the 1986 U.S. Amateur, and the 2008 U.S. Junior Amateur. The Jack Nicklaus-designed layout will again provide a stern test to the world’s best. Some of the biggest names in golf, including World Golf Hall of Fame members Jack Nicklaus, Lee Trevino, Raymond Floyd, Kite and Watson, are past champions of The Tradition. In 1990, Nicklaus made history at The Tradition, becoming the seventh player in Champions Tour history to win his first start on what was then known as the Senior PGA Tour. He birdied three of the last five holes on the Nicklaus-designed Cochise Course at Desert Mountain (Scottsdale, Ariz.) to post a four-stroke victory over close friend and competitor Gary Player. Nicklaus followed up his historic victory in 1990 with a win in 1991, and he won the Tradition again in 1995 and 1996 to become the first player in Champions Tour history to win the same event four times. He remains the only four-time champion in Tradition history. In addition to this year’s field having 10 World Golf Hall of Fame members, including Tom Watson, Bernhard Langer, Sandy Lyle, Curtis Strange, Larry Nelson, Hale Irwin, Tom Kite, Nick Price, and 2013 inductees Fred Couples and Colin Montgomerie (a Champions Tour rookie), the field also includes nine former Ryder Cup players and one current captain: Tom Watson, who will lead this year’s U.S. Ryder Cup team on the Nicklaus-designed PGA Centenary Course at Gleneagles in Scotland. “This year’s field is one of the strongest Shoal Creek has seen since the championship moved to Birmingham in 2011,” said Matthew Dent, tournament general chairman. This year’s edition of the Regions Tradition will include eight players making their debut in the tournament. New comers include Montgomerie; Jeff Maggert, who won his initial start on the Champions Tour in the Mississippi Gulf Resort Classic in March; John Riegger; Joe Durant; Scott Dunlap; Wes Short, Jr.; Anders Forsbrand; and former Masters champion Ian Woosnam. As a Champions Tour major, double Charles Schwab Cup points will be awarded to the top-10 finishers in the Regions Tradition. This will be a critical factor at season’s end in determining the Charles Schwab Cup champion at Desert Mountain. Through seven events, Langer is the early leader, with 1,169 points, followed by Couples (781), Jay Haas (580), Montgomerie (471), and Michael Allen (365). 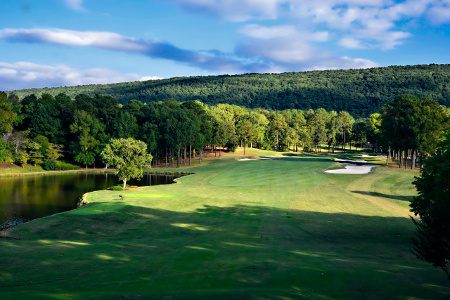 The tournament, which began in 1989 on the Jack Nicklaus-designed Cochise Course at Desert Mountain in Arizona and first came to Alabama in 2011, was originally intended to be played at Shoal Creek for just one year. Following a successful tournament in 2011, the club agreed to host for two more years. Recent negotiations solidified Shoal Creek as the host venue for 2014 and 2015. The Regions Tradition will then relocate just a few miles away to Greystone Golf & Country Club for 2016, ’17 and ’18. The Jack Nicklaus-designed layout opened for play in 1976, earning the distinction of being the Golden Bear’s first solo domestic design. It has been a 34-year mainstay on Golf Digest’s list of America’s 100 Greatest Golf Courses, ranking as high as No. 14 from 1985 to 1986, and most recently ranked within the list’s top-75.